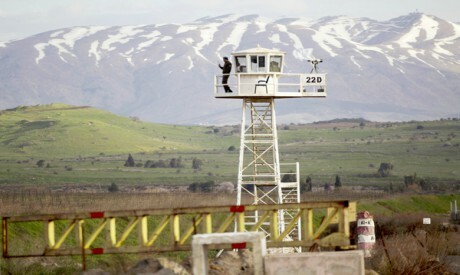 More than 20,000 Syrians live under Israeli occupation in the Golan Heights in four neighbouring villages in the highlands of Mount Hermon, among them Majdal Shams, Masaade, Buqaata and Ain Qiniyye. The residents are Druze, primarily farmers, who face considerable hardships because the farmland is scarce and mountainous and because of Israeli harassment. Historically, the Golan region was a main thoroughfare between Syria, Lebanon and Iraq on the one side, and Palestine and Egypt on the other. Ancient Egyptian, Persian, Assyrian, Chaldean, ancient Greek and other armies fought there in antiquity, and the area takes its name from an ancient Babylonian city that was once located there that thrived from trade as well as from its prime location. Ancient texts from the Tel Al-Amarna site in Egypt tell of a long conflict between the ancient Egyptians and Hittites that ended with the Egyptians taking control of southern Syria in the 9th century BCE when the area represented vital security depth for Egypt. The Golan was occupied by the Assyrians, Greeks, Byzantines and Ghassanids until the arrival of the Muslim Arabs in the 7th century CE, who conquered the area in the famous battle of Yarmouk in south Golan in 636 CE. From there, the Arab armies then crossed to Damascus and Palestine. Israel expelled 130,000 Golan residents when it occupied the region in 1967, and 50 years later these have multiplied into 500,000 displaced people who still dream of returning home. After the occupation began, Israel levelled most of their villages, including 130 villages, 112 farms and the two cities of Quneitra and Fiq. It then brought in some 20,000 Israeli settlers in 33 settlements, providing them with financial aid and special privileges. According to Israeli statistics, 20 per cent of Israel’s wine is produced in the Golan region, 25 per cent of its wheat, 40 per cent of its beef, six per cent of its milk, between 30 and 50 per cent of its fruit and 50 per cent of its mineral water. Some three million tourists flock to the region annually, the settlers use 76 million cubic metres of water and there are some 600 Israeli military checkpoints and bases there. The Golan Heights has 1.2 billion cubic metres in water reserves, and along with Mount Hermon supplies Israel with one third of its water needs. Major springs in Golan include Beit Jin, Wazani, Ghour, Barjiat and others, as well as the Yarmouk, Banias and Raqad Rivers which flow into Lake Tiberias or the River Jordan, providing 700 million cubic metres of water. In December 1981, the Israeli parliament, the Knesset, decided to annex the Occupied Golan Heights and impose Israel laws, giving Golan residents Israeli citizenship. Israel’s ambitions in the Golan did not start with Begin, since the area was at the centre of Zionist ambitions throughout the 20th century. In 1918, former Israeli prime minister David ben Gurion drew a map of what he projected as Israel that included the Golan Heights, Mount Hermon and other territories having sources of water. Zionist leader Chaim Weizmann demanded in a 1920 memo to the then British prime minister that the Golan Heights be annexed to the then British mandate of Palestine. After the establishment of Israel in 1948, the Zionist movement took every opportunity to achieve this goal. The Syrian population of the Golan Heights rejected the annexation decision and the surrender of their Syrian citizenship for an Israeli one. The Israeli forces responded with violence to their protests, and more than 700 Golan residents have been arrested since the occupation began, with many remaining in jail. Israel has made life hard for the Syrian residents of the Golan, imposing tariffs and taxes on them. Based on an agreement supervised by the International Red Cross, Syria began importing 10,000 tons of Golan apples a year some years ago. It also accepts Golan residents in Syrian universities and has eased the requirements for them. Since the Golan Heights were occupied by Israel 42 years ago, successive Israeli government have expressed their desire to hold onto them. Former Israeli prime minister Yitzhak Rabin said that keeping the Golan Heights was essential for Israel’s security, while former foreign minister and prime minister Shimon Peres said they were a vital economic necessity especially because of their abundant farmland and water. The Syrians insist it is impossible to reach a settlement with Israel without the return of Occupied Syrian Territory, but Syria at present does not have the power to achieve this goal.